As a landlord or property owner who demands the best, when you're looking for affordable services for garden design in Paddington W2, quality is going to be a big factor. But how can you know when you're hiring the service that's right for you? 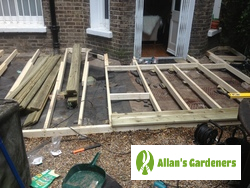 What sets Allan's Gardeners apart from other gardening companies is the no-obligation on-site consultation that starts off your work. This gives you the opportunity to discuss your plans and ideas with an expert who can offer advice and describe how professionals are going to handle things for you.What's more, with us you only pay for the job you need done - not for how long it takes. 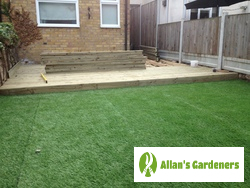 Allan's Paddington W2 garden landscapers will arrive on the day of your appointment on time, equipped with all of the tools needed to get the job done and eager to begin work. They’ll take into account your thoughts and will create a plan that uses every inch of space to its best advantage. Whether you want something low maintenance, a specific theme, a garden to delight the senses, or a safe area for your children to enjoy, they’ll have the ideas and designs to make it work. Special deals - when you book combined services at the same time such as our guttering or lawn care services, you'll be offered extra discounts from your final bill! Get in touch, tell us a bit about what you're looking for, and get a quote for your garden design in Paddington over the phone, on 020 3746 3128. When an online option works better for you, leave your details on our contact form or get an instant initial estimate through our live chat service. Follow this up by arranging a site visit from a designer and take the time you need to explain what you'd like to see at the end of the job. A garden design appointment isn't free, but it is without obligation. The landscape designer will listen to your wish-list, go away to draw up plans and you'll receive a quote for the whole job within 3 working days of your site visit. Don't live in the Paddington area? No need to worry - our professional services are also available in Ealing, Hammersmith, Kensington, Watford, Rochester.